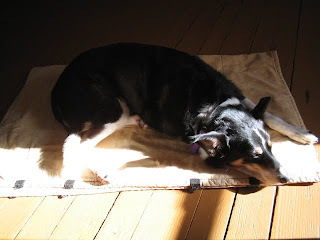 Rambling Moose: Does Your McNab Dog or Border Collie Respect Ownership? Does Your McNab Dog or Border Collie Respect Ownership? My dog is a shelter dog. I got her when she was a year old. She had been trained then abandoned at 6 months, stayed in the shelter another 6 months. The numbers could be off, nobody knows for sure. The posting on Petfinder said she was an amazingly smart girl, and I was not ready for how smart she was. The breed is most likely a Purebred McNab Dog, although there may be some Border Collie in her. We doubt the Border Collie, but either way, she's smarter than anyone in the house, even the people some days. Any active and intelligent dog needs exercise and mental stimulation so I have to walk her 3 times, 1 mile each per day. Luckily I live near shopping centers and bars so she gets to talk to the people she so loves. When I get home, I have noticed that her behavior is probably the most respectful I have ever noticed with any dog. By respectful I mean that she knows what is hers, what is mine, what is ours, and she will not deviate from the norm. For example, most people who have Huskies know never leave food out. If you do, your faithful dog will grab that off the plate you set out and enjoy it. It is their nature. My Lettie has never exhibited this trait. She used to put her paws up on the counter until I told her (loudly) not to, but only to watch. I keep her dog food, Purina Lamb and Rice, in the bag on a chair, freely accessible to man and beast. There is nothing to stop her from waiting until I've gone out or gone to sleep and pull the bag off the kitchen chair perch, spill its contents out and eat until she's full and then some. The difference is that she knows that the bag is mine, but the cup I feed her twice a day is hers. The bowl is ours since I am able to move it away or add things to it as I do sometimes due to my own needs. She simply will not eat from the bag although she knows clearly by her behavior what is in it. The other thing I have noticed is that the mat is hers. She has five different mats that are in circulation, like the one in that old picture. She will sleep on anything resembling a mat, so I have learned not to leave clothes on the floor as well as papers or else they'll end up coated in black and grey fur. As she is getting older the mat transitioned from ours to hers. She's getting territorial about those mats, especially late at night when the house is preparing for sleep. I've gotten barked at by simply going to hang up my clothes so I have decided that we're going to share ownership - it is time to take back possession of those mats. Since I do not believe that slapping a dog is anything more than violence, the path that is taken is a more passive or even passive aggressive one. I wait for her to get on the mat and then I sit down next to her. It is a direct challenge to the behavior and sometimes I get a show of teeth and a grumble. She is not a young dog at this point, her arbitrarily assigned birthday is Thanksgiving and this year will be Lettie's 11th birthday. Behaviors are slower to change especially since she's getting selectively deaf. Especially at 11 at night. Last night we had one of those sessions, she sat down, I put my arm over her without touching, then pet her head gently as the fearful side came out and she showed teeth. Eventually she thought "I've had enough of this" and walked out of the room. After my calling to her while I had not moved, she walked away. With a quick "Good by" I closed the bedroom door. My Door. For the next hour she would sniff at the door, lay against it, even pawed it once to check if it were open, but nothing aggressive since she did not own the door. An hour later when I went out to grab a small bit of water, she met me coming out of the bathroom wagging her tail furiously. As if to apologize, she slipped into the room past me, ran to the mat and sat down pawing at the air beckoning me to approach. All was forgiven for tonight, we hugged on the mat and on the floor and all grumbles forgotten. So in writing this, I have to wonder whether your McNabs and your Border Collies and other intelligent dog breeds have this entertaining quirk. If you are considering an intelligent breed like those or a Standard Poodle, German Shepard Dog, or Australian Shepard, remember you are committing yourself to years of intelligence and getting a friend who will constantly surprise you with their learning ability. If your intelligent breed dog fails to do something you like, it is more likely the human's fault and not the dog's. Since these dog articles are widely read (some of them every single day) even almost 2 years after being written, feel free to write your thoughts, I'd be interested in seeing them. I promise not to close the door! Thank you Anadæ! I have noticed all of these traits in my own Lettie. One thing people have to consider when they're getting one of the more important breeds is that if they aren't committed to keeping them intellectually challenged, they're in for a rough time of it. Chaser in the article is so intelligent because he lucked into an owner who was able to give him that stimulation, both mentally and physically. Now since Blogger doesn't want to take my comments directly, we'll try Anonymously! Sheesh, Modern Technology! Yes my McNab is very respectful of our stuff. Even as a puppy she never chewed our stuff, but if we gave her something it would be chewed on immediately. Our dog is also exactly the same way about food and her counter manners. She puts her front paws on the counter, looks but never touches anything. We have left a dinner plate with a steak on a coffee table. She could easily eat it, but never touches it because we didn't give it to her. We never trained her to be so polite so it must be a inbred instinctive behavior.